The RobotZoo Gecko Window Cleaner, with a dexterity that can surprise! 100-240V 50/60Hz 2.5A AC Adapter with RCM compliance. 800 mAh, 14.8V lithium backup battery, charges during operation. Dimensions – 29 cm Long x 14.2 cm Wide x 11.5 cm High. 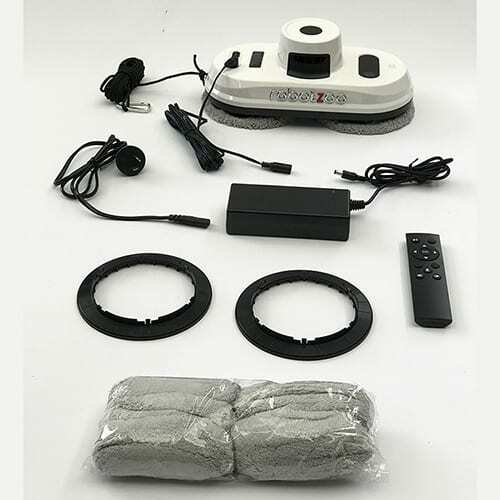 Remote control operable within 10 meter range. Accessories – AC Adapter , Safety Rope + metal carabiner, IR Remote, Extension cable, cleaning rings x 2, cleaning socks x8. Want to know more about the RobotZoo Gecko? The robotic window cleaner is relatively new. They have been around for only a few years, but already there are some exciting new models coming out. The RobotZoo Gecko, which appears to ‘walk’ across the window surface, is one of the original types. And the RobotZoo glider, which appears to ‘glide’ across the surface, is one of the newer types. the RobotZoo Gecko is about half the size of the RobotZoo Glider. 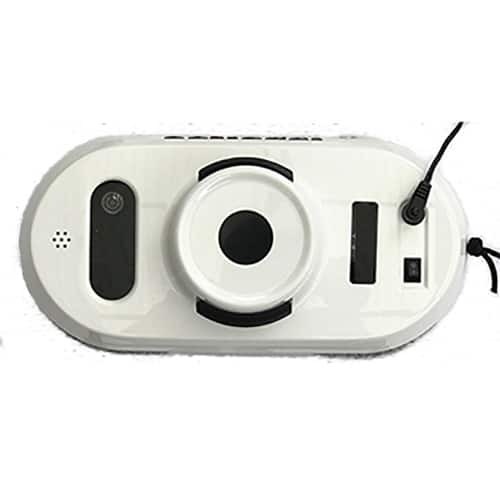 There is a rechargeable backup battery on board to allow the device to continue to cling to the window in the event of loss of the mains power. What’s special about the RobotZoo Gecko window cleaner? 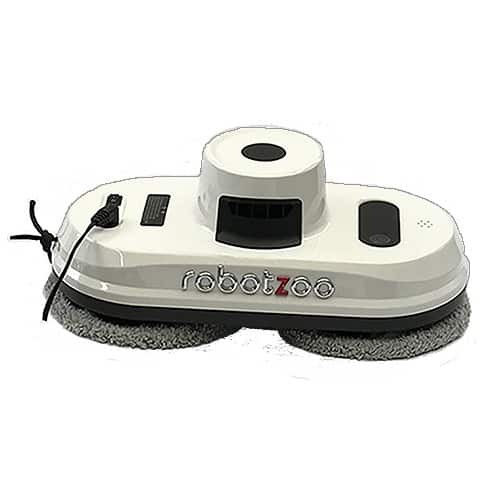 The RobotZoo Gecko window cleaner is a versatile robotic window cleaner that’s able to adapt to all sorts of tasks. Not only can it manage framed windows, but it can detect the edges of frameless glass as well. It’s also useful for bathrooms, to clean soap scum from tiled walls, shower screens and even floors. Try it out!. Being about 15cm x 30cm, the RobotZoo Gecko cleans at about 3sqm per minute. It takes around 10 minutes overall to finish a 1m x 2m double sliding glass door. 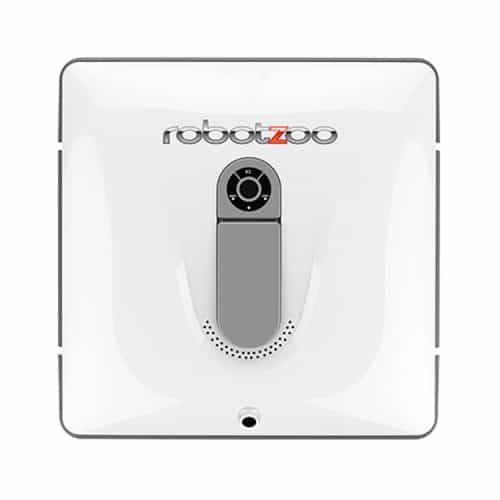 The RobotZoo Gecko window cleaner comes with an Australian compliant power supply. Accessories and consumables from the RobotZoo homesite. RobotZoo provides a 12 month BotCare warranty. And there’s benefits of being a RobotZooMember for anyone who takes one home. What do you need to know about safety? Robotic window cleaners are generally safe to run, when they’re used properly. They connect to mains power, so should always be used in a dry environment, never in wet conditions. Window spray is sometimes required. 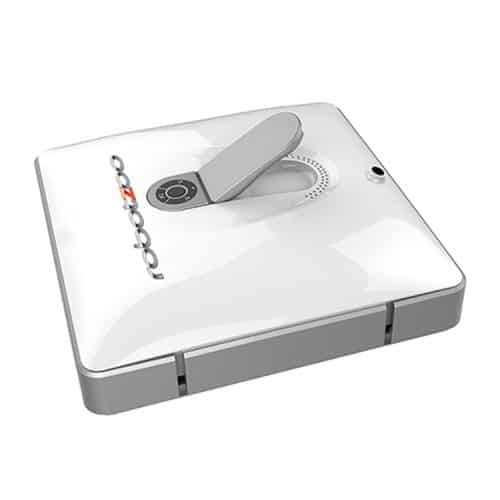 The devices operate at relatively low power and speeds, so it’s hard to hurt yourself using a robotic window cleaner. Unless one falls on you. But there’s a safety rope to help prevent that. The AC Adapter is all important. It must comply with Australian standards, carry the RCM mark, and include the standard 3 pin Australian wall plug. RobotZoo is very careful about these points. Heavy fines and jail sentences apply to anyone selling electrical equipment in Australia that is non-compliant with Australian electrical safety standards. And so they should. Many suppliers, particularly on Ebay, Amazon or Alibaba will ignore these points, either wilfully or out of ignorance. Especially those overseas suppliers selling online who are out of reach of Australian law. There is no protection for Australian consumers who try to save a few dollars buying from these overseas suppliers. So buyers beware! If the window cleaner is being used on external windows high up, there is a remote possibility that it could fall and hit someone below. That’s why all RobotZoo window cleaners have a safety rope with a metal carabiner clip to attach them to something fixed. If the device falls off, the safety rope should prevent any damage being done.